Many of the activities I do with my kids are decided upon at the last minute. Part of my last minute approach is to keep things simple and easy, and not have to make a lot of plans. Another part is because I can’t focus on weekend or evening activities while I am at work. Lastly, I like to wait until I see what I feel like doing (as well as what my kids might feel like doing), and want to keep our precious free time feeling “free”, rather than scheduled with a bunch of activities we have to do. An easy outing with my younger child is to go to a playground or park, and I am lucky to have lots of great parks here in Westchester. One of my favorites is the New Rochelle Jack’s Friendship Garden which is located on North Avenue next to the Huguenot Children’s Library. 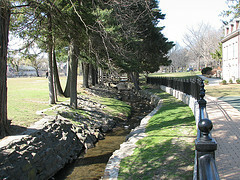 It’s a great playground, and was listed in the New York Times as one of the great places to go in Westchester. What’s not to love about this playground? First, it is wheelchair accessible, specifically the entrances, climbing structures and the swings. 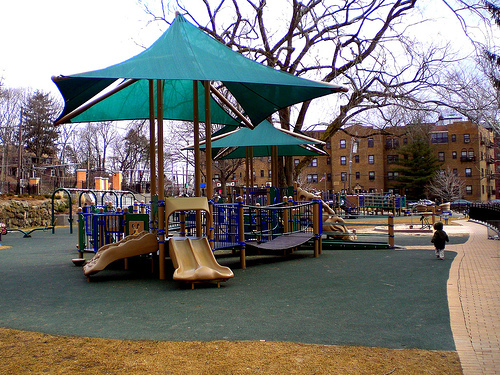 There is one huge climbing structure for kids up to five years old, and another for older kids up to 12 years old- although kids of all ages run back and forth between the structures. In addition to stairs, each climbing structure can be accessed by ramps that run the length of the structures. There are the usual baby and regular sling seat swings, as well as reclining seats which can be used to support and push children who cannot swing themselves. Second, the sand pit has a small hand controlled crane which is a favorite of the kids, and another large play structure that I cannot really describe. Third, there is a large Sway Fun ride that the kids rock back and forth, and I overheard one child describe it as a pirate ship. All of this, plus seesaws, plenty of benches for the adults, and frequent visits from ice cream trucks makes this a great place to spend an afternoon. I am trying to discover another children’s playground that is better than this one, but haven’t been able to find one yet. Other activities can be found right next to the park include the Huguenot Children’s Library where you can get books, videos and DVDs—or potty as needed, and there are often planned activities and story time going on there. Right behind the park is a small creek, and crossing that takes you to the Huguenot Lake, which is great for walking or running, the beautiful New Rochelle High School with its French Gothic architecture, which is great for viewing. All of this makes it a great setting to spend a leisurely afternoon.